Want the body of your dreams from the comfort of your home, office or on the go for an affordable price? 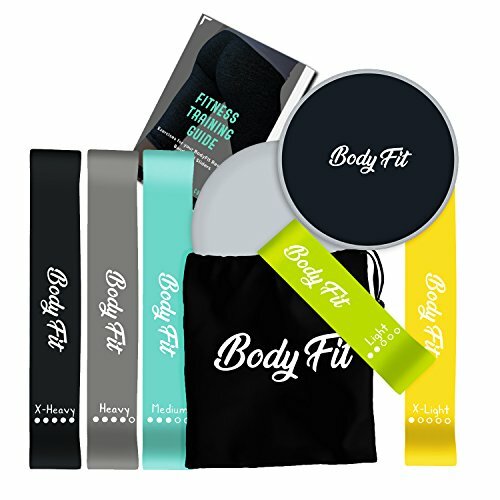 Our exercise resistance bands are made of the highest quality 100% genuine eco-friendly latex, meaning they are durable and gentle on the skin. They will not lose their resistance over time, they do not roll up mid-exercise and are stronger than other brands on the market. The best part is that they are versatile. YOU CHOOSE the resistance level. They're perfect whether you're looking for a beginner workout set or an advanced fitness set. Our abdominal core discs have been developed to withstand extreme pressure. They are dual sided and are able to be used on multiple surfaces: carpet, hardwood, tile, laminate, and more! Use the sturdy plastic side for soft-surfaces and foam grip side for hard-surfaces. The best part about these disks- they will NOT mark your floors. What you will receive: 2 double sided sliding discs 5 resistance loops (3-30lbs) 1 carrying bag for convenience These bands are ideal for: -Boosting confidence -Sports -Body shaping Body building -Pregnant women (consult with doctor), after birth and busy moms and dads -Weight loss -Yoga Pilates -P90x, Insanity, Crossfit, Beach Body, 80 Day Obsession -Injury, Physical Therapy -Recovery ACL tears and knee replacements. MULTI-FUCTIONAL TRAINING, FIT FOR EVERYONE: We believe that no matter who you are, you DESERVE a heathy body. You can integrate our bands and sliders with general fitness, stretching, and strength training. Perfect for popular workout programs such as BeachBody 80 Day Obsession, yoga, cross-fit, pilates and more. YOU get to choose the training style and the resistance from our 5 resistance bands. No matter your fitness level, YOU CAN GET THE BODY YOU'VE DREAMED OF! REDEFINE YOUR CORE AND MUSCLES: These will give you a low-impact, yet effective and high-intensity ab workout. Strengthen and condition your entire body. Our premium core sliders are perfect for mountain climbers, upper body movements, and pikes. Use the mini resistance loops for squats, abs, and glute exercises. Whether you're a new mom, recovering from an injury, or just want to get fit, our resistance bands and slide disks are the perfect addition to any fitness program. WORKOUT ANYWHERE AT ANYTIME: Whether you're at the gym, traveling or at home, our resistance bands and gliding discs are the perfect addition. With your convenience in mind, we have added in a premium carry bag. When purchasing our product, we want you to receive as much VALUE as possible! On your box, you will find out how to access your BONUS EBOOK and WEBSITE, with exercises to get you started! Your bundle will also include a comprehensive instruction manual with tons of on-the-go workouts. LONG LASTING WORKOUT GEAR: Our durable sliders are double sided. The sleek plastic side is to be used on carpet and soft surfaces. The woven fabric layer is for use on hardwood and laminate. No chaffing of the fingers, no scratching or scuffing of the floor. Pick from our set of 5 resistance bands, X-Light, Light, Medium, Heavy, X-Heavy. Our bands have been PROVEN to last with normal wear and tear. They do NOT stretch out or roll up. There is nothing stopping you, ORDER NOW... THANK US LATER! If you have any questions about this product by KCM Fitness, contact us by completing and submitting the form below. If you are looking for a specif part number, please include it with your message.